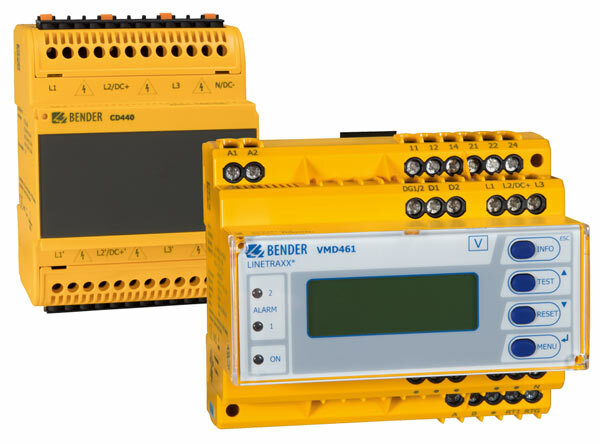 The multifunctional voltage monitoring relay VMD461 monitors frequencies, undervoltages and overvoltages in DC, AC and 3(N)AC systems. The phase voltages and/or line-to-line voltages are measured as r.m.s. value and are continuously shown on the device display. The corresponding ANSI codes for all available measuring functions are provided. Configurable delay times allow considering special installation-specific properties (e.g. device-specific start-up procedures). The VMD461 requires an external supply voltage. The optional use of a CD440 coupling device extends the voltage range that can be monitored to DC/3AC 1200 V or 1AC/3NAC 690 V.